It Is 1979 All Over Again, & Obama Is CARTER, NOT Reagan. In arguing that U.S. competitiveness is at stake, Mr. Obama plans to use his nationally televised speech to try to frame the spending debate with Republicans that is expected to dominate Congress in the coming months. “We seek to do everything we can to spur hiring and ensure our nation can compete with anybody on the planet,” Mr. Obama said Friday after touring a General Electric Co. plant in Schenectady, N.Y. He cited clean-energy manufacturing, infrastructure and education as keys to competitiveness. 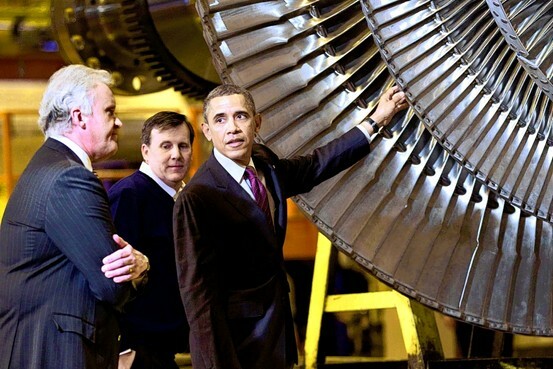 Previewing the expected theme of his speech, Mr. Obama on Friday appointed GE Chief Executive Jeffrey Immelt to lead a new President’s Council on Jobs and Competitiveness. Idaho, the first state to sue the federal government over the health care overhaul, has announced plans to resort to an obscure 18th century legal remedy that recognizes a state’s right to nullify any federal law that the state has deemed unconstitutional. nullification, by those sovereignties, of all unauthorized acts … is the rightful remedy. Idaho is not the only state considering nullification as a remedy. Six others, including Maine, Montana, Oregon, Nebraska, Texas and Wyoming, are also considering bills that would in essence nullify the president’s signature on the reform law. There are now 27 states that are in on the lawsuit against Obamacare. What if those 27 states do the same thing we do with nullification? It’s a killer. During all of the furor over Arizona’s SB1070 immigration enforcement law last spring, one of the most egregious attacks on the sovereignty of the border state came in the form of a highly inappropriate and insulting speech by Mexican President Calderó n before the U.S. Congress. As the Democrat dominated chamber applauded the attack on Arizona, our hapless commander in chief and his constitutionally challenged attorney general were threatening legal action despite having not taken the time to have read the 10 page bill. Comparisons were made to Nazi Germany and liberals expressed outrage over the mere thought that Arizona police officers would be demanding to see the papers of anyone who appeared to be Hispanic. Naturally the new law (which mirrors federal statutes) included appropriate constitutional protections and did not allow for the indiscriminate checking of papers, but never-the-less the Democrats and their fellow travelers in the MSM pressed their agenda driven attack and legal action from the federal government is still ongoing. Fast forward nine months. The UK Telegraph reports that the Mexican government of President Calderó n is instituting a high-tech new I.D. system which will be in place by 2013. The new cards which will include an iris scan, fingerprints, photo and signature are said to be 99% reliable. “The legal, technical and financial conditions are ready to start the process of issuing this identity document,” Felipe Zamora, responsible for legal affairs at the Mexican Interior Ministry, told journalists Thursday. The new system will be implemented gradually beginning with children over the next two years and then the adult population by 2013. The system will help the Mexican authorities to keep track of their citizens and should help Mexico to secure its borders against illegal immigration. The cost of the project is estimated to carry a price tag of $25 million. Human rights advocates have expressed concern that the new system will be used for the gathering of personal information which could be used to violate individual rights and privacy. In the meantime it will be interesting to see if the Mexican government, which has published guide books on how to illegally cross the border and elude the authorities in the United States will warn its citizens not to show their I.D. cards to the gringos in Arizona (or elsewhere). Dear Readers, Can you help me spread this most important article and question wide and far? Wanting your country back is not the same thing as working to take it back. One is a wish, the other, a viable plan in action. Years ago, when asked if anyone was ever going to stop the insanity in this country, I’d answer, I sure hope so! Now, my answer is – I don’t know, what are you doing to stop it? Because if it isn’t you and me, the answer is nobody! As patriotic Americans wait to see if the new Republican House majority is truly going to repeal ObamaCare, or shrink into some inside the beltway capitulation and collusion effort under the guise of repeal, I have to ask – what if they don’t repeal… then what? For years now, patriotic Americans have protested, petitioned, rallied, faxed, emailed, called and even confronted their so-called representatives face-to-face in town hall meetings that most elected officials dare not even attempt today. Still, their government has marched against the people and their states, shoving anti-American policies and laws down the throats of Americans, a majority of whom stand wholly opposed. Now that the people have put Republicans back in control of the people’s House, what if they fail to force the nation in a new pro-American and pro-freedom direction? House Republicans have to be willing to run over Democrat opposition, just like Democrats ran over them for the last six years. Then they have to find support in the Senate, or what they accomplish in the House is moot. Last, if they have the backbone to get past the House and Senate, they have to get the White House to sign off on what they pass. This is what the people elected Republicans to do, but can they do it? The repeal of ObamaCare is only the first test. The list of anti-American policies in need of repeal is almost without end, thanks in large part to Democratic Socialist control of all branches of government. I understand—Rome wasn’t built in a day. But it sure didn’t take Rome long to collapse under ill-advised policy decisions and America is on the ropes. Wanting your country back is one thing—Taking it back is quite another. Allow me to point out that the other folks won’t just give it back without a fight. In fact, there is NO limit to what they are willing to do to retain control. Unlike the political right, the political left has no rules of engagement! Before we can take our country back, we must take our local communities back and position our states to do battle with and liberate themselves from the over-reaching federal government. It’s almost a hundred years now, that the false assumption of supreme federal powers has been the lay of the land in all three branches of the federal government. How dare the people challenge that false assumption at this late date. In short, any powers not specifically delegated to the federal government in the US Constitution, are powers that belong to the states and/or the people. Therefore, any executive orders, legislation or judicial precedents from the federal government that are not powers delegated to the federal government, are by definition, unconstitutional. Most of what the federal government intrudes into today is by this definition unconstitutional, and neither the people nor the states have any legal, moral or ethical obligation to accept or adhere to those intrusions, according to the Tenth Amendment. In accordance with the Tenth Amendment, the states have the right to nullify any federal statute, executive order or judicial opinion which is wholly at odds with the US Constitution or beyond the scope and authority delegated to the federal government therein. Several organizations have put forth issue oriented nullification bills at the state level, like the nullification bills designed to nullify ObamaCare or federal gun laws at the state line. However, the political left is attacking on a thousand fronts daily, not one or two policy initiatives. For this reason, state nullification powers must be broad enough to nullify any and all unconstitutional acts by the federal government, it must be able to reach back to nullify previous unconstitutional acts, it must itself be constitutional and it must put the power squarely in the hands of the states and the people, in compliance with the Tenth. Conservative patriot organization The United States Patriots Union, through its Constitutional Justice Division, drafted and released a broad-based state nullification bill last week. Partnered with Stand Up America, the two organizations have early support for the measure from legislators in twenty-six states, as we await support from the Tenth Amendment Center and new media publishers. For those serious about taking their country back, this is how it can be done, not by elected politicians in Washington DC, most of whom will oppose this measure even though they campaigned on these principles and values. This is how the people take their country back, via their state elected officials, who must force the federal government to live within the confines of the Constitution. Patriots, Tea Partiers, conservative pundits, true constitutionalists and conservative new media outlets can and should support the concept of constitutional government a number of ways. Those who want to directly engage taking their country back can join in the unification of American patriots at The United States Patriots Union and strategic partner Stand Up America. Those who want to support this initiative can do so by donating to the organizations and spreading the word to other patriots, especially in their state legislatures. People serious about taking their country back are serious about developing clear and constitutional strategies for accomplishing that goal. Dreaming about taking your country back is not the same and setting the goal of taking it back. A goal requires a coherent strategy for achieving that goal. Without a working strategy, it’s just a dream that will end in a nightmare. Buoyed by strong Tea Party support during his campaign, freshman Senator Mike Lee (R-Utah) has arrived in Washington and says he’s determined to take significant steps to rectify the staggering U.S. deficit. Lee talked to Fox News on Sunday about his proposed constitutional amendment to balance the budget. In order to propose such an amendment, several steps would need to be taken. The first option, which Lee says is the path he will choose, is for both houses of Congress to pass a two thirds majority vote. The second option would be a Constitutional Convention, which would also require a two thirds vote from state legislatures. The proposal would then need to be ratified. When asked about cutting government programs, including those that could be lifelines for Americans, Senator Lee took a strong stance, saying “no program will be held immune from review” and that Congress needs to consider “categorical across the board cuts” regardless of a program’s perceived importance. Speaking during his weekly internet and radio address over the weekend, President Obama called for bipartisanship among both parties in Congress, citing reduction of the budget deficit as a top priority.